If you don’t follow our Facebook or Twitter pages, you may not have seen the post that my project was selected for Stitch Craft Create’s upcoming book (Spring 2014). Even thought the release date is so far away, projects were due this month – which means I had to get crackin’ on my final design! 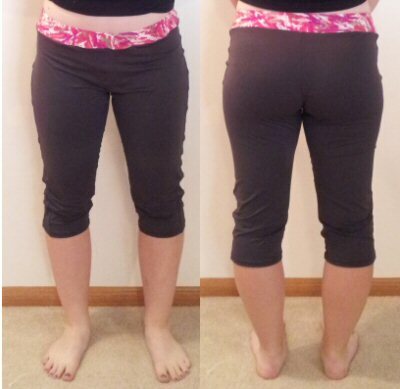 The photo on the right is a glimpse of what I sent in. I really like the fabric combinations (it took me at least 30 minutes to finally decide on what to use) and was thrilled that Taylor thought it was a cute design as well – in fact, I wound up having to make her one as well. I can’t wait to be able to show you what I’ve submitted! This entry was posted in Uncategorized on June 28, 2013 by stacy. Nothing says summer like a straw tote. Learn how to make your own with this new tutorial from We All Sew. Love maxis but tired of the same, boring design? Here’s a different take on a favorite look: a high-low, faux wrap. Create a pretty feminine frock for your little one with this tulip hem dress or sew up something a bit more patriotic, like this Stars & Stripes dress (both by Blooms ‘n Bugs)! This button top apron will look pretty if you wear it in the garden or the kitchen! I’m not quite sure how my hips would look in this one, but I love the lines of this Peg-Top Skirt. It’s not sewing, but I love this cross style woven chain tutorial – it’s great to see pretty jewelery that’s not difficult to make yourself! After a long day of work, slip your tootsies into a pair of pretty, new ballet slippers. Summer may already be here, but it’s never too late to stitch up a spring tee. Plus, it’s a great way to play with stripes! Keep the sun out of your kid’s eyesface with this reversible bucket hat from Oliver + S. Now if I could just find an adult version for my husband! Military style gear is definitely in fashion at the moment. Learn how to transform an over-sized camomilitary shirt into a cute, new top. This color block tie is a playful twist on a dressy look! Create a bandage style skirt with just a bit of stripe fabric! This entry was posted in Uncategorized on June 27, 2013 by stacy. I have to admit, I love the neon trend… I just don’t want that much neon in my wardrobe. 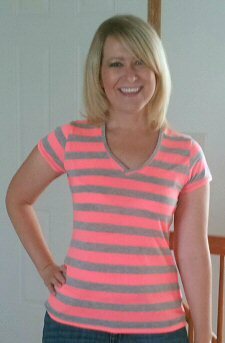 So when I saw that Girl Charlee carried a variety of neon and gray stripes, I decided I had to have at least one – the hot coral. My first thought was to make a tank style dresstunic (Jalie 3245), but realized that my daughter has a dress almost exactly like this in her closet. So, I made the next best thing – a short-sleeved, V-neck style tee from Jalie 2805. Unfortunately, the photo is the only time I’ve had a chance to wear it because my daughter snatched this top up and wore it immediately. I guess I should have ordered more fabric so I could have made two! This entry was posted in Uncategorized on June 26, 2013 by stacy. While I love sewing, I have to admit, I like to branch out to other crafty pursuits every once in awhile. 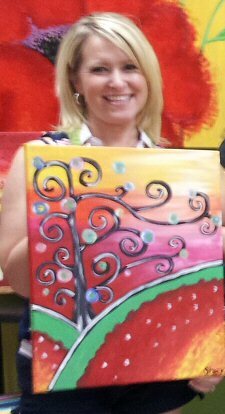 Recently, a group of friends and I got together to try out a new, local store that ‘teaches’ you how to paint a specific painting (you select the class based on the painting you want to create – ours was “Funky Tree”). I have to admit, I was totally impressed – in under 2 hours everyone (we had a class of 30) had a painting that looked almost exactly alike! I can definitely see doing this again in the future – I even scoped out which painting(s) I’d like to try next! Also this month, I created some party favors for Taylor’s birthday party – painted glasses. 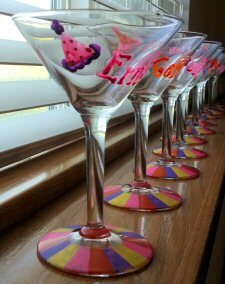 We had purchased some inexpensive martini glasses and non-toxic paint markers to customize each glass with the guest’s name. After decorating each one, I baked them in the oven in hopes that the design wouldn’t come off. While this worked to an extent, only very gentle hand washing keeps the image from rubbing off – even after heat setting each one. On the up side, each glass was well received and they enjoyed drinking mock-tails out of them. This entry was posted in Uncategorized on June 25, 2013 by stacy. Overall, these were very easy to sew and I love the details (there is a nice ‘vent’ on the bottom of the pants, stitching along the seams which would look great in a contrasting thread, and a separate piece for the waistband so you can make it contrasting or matching). Unfortunately, I hate the fabric. I had tons of skipped stitches with the dry weave material – no matter what needle, machine setting, etc. I used, it still skipped. Consequently, it took me twice as long to sew this one and with a lot of headaches. As for the fit, it is a bit ‘off’. I had originally made these to fit me, but they actually look better on my daughter. I found that the legs were a bit too baggy (especially in the calf area) and droopier in the backside. Even though this style fits better on her, I think that it’s still too large on her as well (it looks great in the back, but, as you can see, there’s a lot of wrinkles from too much material in the front) – I’m not sure if it’s the fault of the pattern or that the material was too over-worked (because of the skipped stitches). Either way, I can see making this pattern again, although I think I’ll try a friendlier cottonlycra blend instead. Rosemary Olive Oil Bread: If you stumble across this recipe on Pinterest, you may find people tagging it as something you might make in a crockpotslow cooker – this is far from accurate. While it’s totally delicious, it is time consuming so be prepared to start it hours before your meal. Bacon Corn Muffins with Savory Cream Cheese Frosting: (pictured above) These little look beautiful when completed (and perfect as finger food for a dinner party), but I didn’t find them to be as delicious as what the reviews lead them to be. Of all the items I made last week, this was probably my least favorite recipe. Pickled Corn and Peppers: I really liked this recipe although the rest of my family refused to try it because the thought of pickled corn turned them off. I wound up having to make a ‘double batch’ of the ‘brine’ because I found it just wasn’t enough to cover all of the vegetables. Cottage Cheese Pie: (pictured above) My husband stumbled across this recipe and sent it to me to put into my ‘must try’ list. Since I had most of the ingredients on hand, I decided to give it a whirl. It’s easy to make and surprisingly sweet, although if you’re not a fan of ‘texture’, you may be turned off by the lumps in the filling. A nice side of berries makes this a nice after dinner treat! Game of Thrones Lemon Cakes (Medieval version): Easily the best new recipe I tried! These little cakes are much like the ones they devour on the show (I made them so we could eat them during the season finale… I know geeky) and turn out more like a scone or cookie than a cake. The ‘batter’ was very crumbly, but was easy enough to work with to mold into a rounded ball (thanks to all the butter and warm hands). I will definitely be making these again in the future – they were a HUGE hit (it also makes me want to buy <a href=”http://www.amazon.com/gp/product/B006L7CG58/ref=as_li_qf_sp_asin_tl?ie=UTF8&camp=1789&creative=9325&creativeASIN=B006L7CG58&linkCode=as2&tag=neoflux”>A Feast of Ice and Fire: The Official Game of Thrones Companion Cookbook</a><img src=”http://www.assoc-amazon.com/e/ir?t=neoflux&l=as2&o=1&a=B006L7CG58″ width=”1″ height=”1″ border=”0″ alt=”” style=”border:none !important; margin:0px !important;” /> for more recipes like this)! Olive Garden Zuppa Toscana: If you’re a fan of this dish from the Olive Garden, you’ll love this recipe! It tastes exactly like what you find in the restaurant although I did think there was far too much sausage in it for my liking (next time I plan on only using 1/2 lb.). I would also recommend the Chicken Nocchi Veronese (from the official site) which is one of our family favorites to make at home! Tortilla Pinwheels: (pictured above) I tried this version because it was much different than ones I had made previously – and it was a hit with Taylor’s friends. I like this version because it mixed a bit of dry ranch seasoning with the cream cheese. Delicious! A breezy and fun shift dress is perfect for a summer evening or beach cover up! If you’re looking for something a bit longer, here’s a tutorial for a super easy, maxi dress style. I need of a new iPad (or laptop) cover? This tutorial is a great way to use up scraps and comes in two sizes to fit your needs! Bring a bit of July 4th into your home – applique colorful hand towels for your bathroom! T-shirts don’t have to be refashioned into a new shirt or little girl’s dress. Turn it into a new skirt, instead. Love Scientific Seamstress patterns? or just always wanted to try one? Here’s your chance to win a pattern from her etsy shop! If you’re a Hello Kitty lover, you won’t want to miss how to create your own HK pincushion and matching sewing basket! Nothing is sweeter than hand made softies. This site (not in English) has patterns for a giraffe, hedgehog, bunny and whale. We all know the importance of pressing. This article shows you what pressing tools you should be using and when. Create a new kind of maxi skirt with a denim topped look. I have to admit, I actually like this style! Make yourself a caftan in just 3 seams! Turn a cheap plastic headband into a stylish accessory (that can even coordinate with your wardrobe)! This entry was posted in Uncategorized on June 20, 2013 by stacy. Just in time for Taylor’s birthday and cheer camp, the quilted Simplicity bag project is done! I have to say, I’m surprised at how much I actually like this over nighter – it’s cute, stylish, and HUGE! 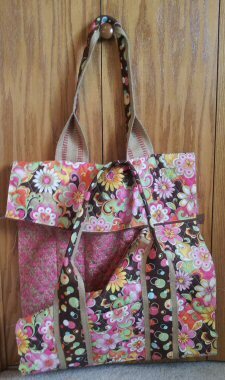 I also like the zippered, expandable pocket on the outside of the bag that helps to keep you a bit organized as well (next time I make this, I may make two). The only downside to this project is the unfinished interior. I did zig-zag the edges to prevent raveling and to make them look a bit neater, but if you’re turned off by exposed seams, this project may not be for you. Pair this up with the fact that the pattern calls for a muslin lining, it might definitely look unappealing on the inside… although I did think using a pre-quilted material with a colorful backside (lining) did help make everything look a lot nicer – your eyes are drawn to the pattern inside and not the seams! Overall, I highly recommend this pattern – in fact, I’m looking for an excuse to make one again! 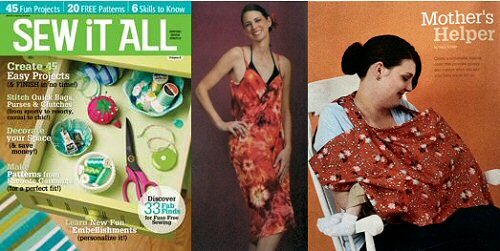 On newsstands today, Volume 6 of Sew It All – with two new projects by me! The first is a wrapped, swimsuit cover-up. You may recognize this design as being very similar to an expensive, ready-to-wear version from a woman with a ‘secret’. Now you can make it for yourself – it’s easier than you think! 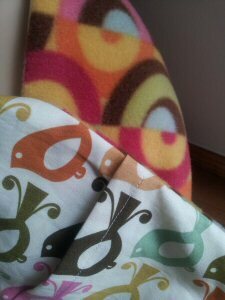 The second project is “Mother’s Helper” an easy-to-sew nursing blanket that is not just adjustable but allows you to be able to watch your child without having to lift up the blanket during feeding (thanks to a bit of boning). 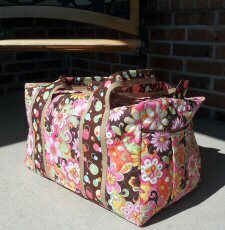 Right before my blog’s server went down, I started work on Simplicity 2274 – the overnight bag. I highly recommend using a pre-quilted material – it’s quicker, easier, and looks very Vera Bradley-ish. Best of all, the lining is prettier than the muslin that the original pattern called for. What surprised me most is how much I actually like jute webbing on this tote. I was skeptical at first, but it totally fits the style of the bag – I’m so glad that I bought ‘extra’ for future over nighters. Now all that’s left is to attach the zippered pocket and the ‘ends’ of the bag… I’m so excited to see this bag in action!